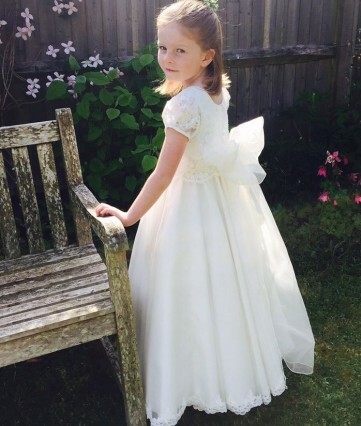 When Nicki’s Granddaughter Grace made her First Holy Communion last weekend, everybody knew that she would be wearing a rather special dress! Grace looked absolutely beautiful in a bespoke Nicki Macfarlane First Holy Communion dress made with an English lace covered bodice and puffed sleeves, a full skirt and sumptuous sash in delicate organza and a beautiful lace trim. If you would like to discuss a bespoke creation with Nicki, see our bespoke page here. To see our ready to wear First Holy Communion collection click here. To tie a beautiful bow like Grace’s see our video page here. This entry was posted in First Holy Communion. Bookmark the permalink.